Looking for a wholesale coffee supplier for your business? Hi, we’re Two Chimps, and we’re a wholesale coffee supplier for tonnes of businesses across the UK. We are based in Rutland and supply coffee to all sorts of companies. We provide wholesale coffee to local pubs, coffee shops, hotels and any other type of business looking to upscale their customer service offering. These at present include soft play centres, hairdressers, estate agents and jewellers, to name a few. The coffee we roast and supply is usually single origin and is hand roasted at our very own roastery. We pack all our coffee ourselves, allowing us to know precisely what we are giving to our customers. Are you lucky enough to own a coffee shop, restaurant, pub, hotel or any other business? Do you feel that your coffee is a bit boring and unimaginative? Or are you looking for new ways of serving to set you apart from the competition? Here at Two Chimps Coffee, we love helping out businesses in our area and further afield. We are confident that our range of speciality coffees are sure to set you apart from your competitors. 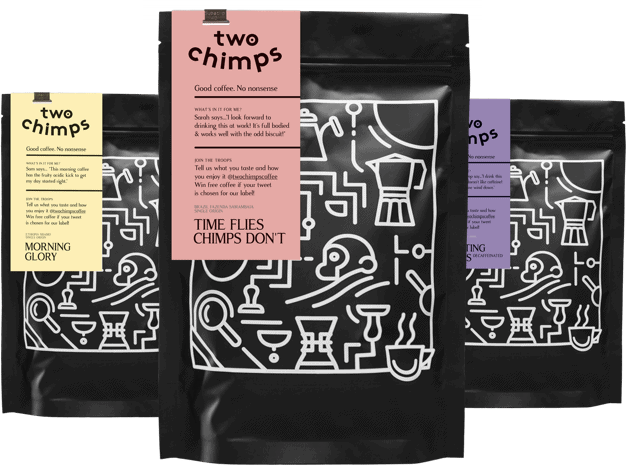 Two Chimps Coffee don’t just want to sell you wonderful coffee that your customers will love, oh no. We want to know all about you and your business! The more we know, the more we can help. As part of our coffee supplier service, we can offer training days, interchain team building competitions, advice and free delivery. Whatever your reasons are for looking for a wholesale coffee supplier, contact the coffee roastery and join the troop! A few of our benefits. Whatever type of business you own, we offer on-site training at regular intervals to suit you and your business. Alternatively, you are welcome to complete your training at our roastery. Training allows you to share your new found skills with others and to be confident in the coffee you are supplying. This, in turn, gives you the opportunity to talk more about the coffee you are serving your customers, allowing them to understand your new found knowledge too. With the help of our magical coffee training guide, you’ll be pros in no time. We also offer team building days as part of our coffee supplier service, which is a great way to spend some time with your colleagues outside of work too. As I am sure you all know, social media can be a great form of advertising. As a customer, we will continually keep active for you via social media. We also write a blog post about your business, using this as a great start to telling the world about the excellent coffee that you now serve. To see blogs about businesses just like yours, find the blog here. We deliver your freshly roasted coffee weekly or as and when you need it. This allows the coffee we provide to be as fresh as possible. Rather than ordering by the case, we offer you the opportunity to order as many or as few bags that you need to see you through the week, adding to our ethos that fresh coffee is the best coffee. We know the last thing you need for your business is an overload of coffee that isn’t fresh. We offer volume discount rates on our coffees in a slightly different way than others. As we want your wholesale coffee to be as fresh as possible, we see no point in offering you a discount for ordering x number of bags at any one time. Instead, we see how many bags you are purchasing on average per month and then find a volume discount that suits. We don’t just offer a wholesale coffee supply, oh no. We also provide cleaning products for both espresso machines and grinders along with milk jugs, barista accessories and takeaway cups. Alongside this, we offer both locally produced small-batch hot chocolate and superb loose leaf teas. When it comes to payment, we offer two types of payment method. The most convenient of these is Direct Debit. Upon setting up a direct debit mandate through our payment provider, the amount due from the previous month is debited from your account on the 15th of the current month. As an alternative, we also offer a cash on delivery option, if this is preferred. We are open to running free trial periods or offering a discounted rate for the first few weeks also. This allows you to get valuable feedback from your customers about the new speciality coffee you have chosen. Invaluable really. Unsure On Your Coffee Supplier? If you are still unsure, get in touch for some samples of our coffee range or to arrange a visit – the chimps love visitors! We can show you exactly what process we go through; from when the raw coffee comes through our doors, to when it goes back out of the door, ready to be delivered to our customers. To find out more about our classes, training days and team building days, get in touch with the team today. So come, meet Rosie the roaster, (yep- we have named our roasting machine), and try some of her coffee, you’re all invited. We can even roast a coffee that will be yours and yours only. Get involved when we choose the coffee, blend it and roast it. Afterwards, name it, know its history and pick how it will be best served. Our promise is not to make the same coffee for anyone else. Our wholesale coffee supplies can be tailor-made to your exact requirements too. We can freshly grind coffee for any device, such as a cafetiere, pour over, stovetop, espresso machine or an Aeropress. We can also leave it whole bean for you. Intrigued? find more information here. While we do not rent equipment at this present time, we do have contracts with some of the best espresso machine manufacturers. We can pass our discounts to you too! At the start of each new wholesale coffee supply, we come and set up your espresso machine and grinder for you. While setting up your machinery on site, we will explain what we are doing and why we are doing it. This allows yourself, and your staff to understand your machinery a little more. We have a superb team of espresso machine engineers that we can recommend to you, should the need ever arise. Fast and efficient, these engineers are on site with you as soon as possible, resulting in the least amount of downtime possible for you and your espresso machine. We offer many different types of point of sale material. These include branded A-boards that have space for you to write whatever you want on them. We have posters and strut mounts that display our logo along with leaflets that give you information on how we source our coffee and how we ensure we are delivering the best possible product to our and your customers. We also offer a bespoke design service, should there be any particular point of sale aid that would suit your business best. So, would you like to know more about us or how our coffee suppliers for business service works? Are you interested in offering speciality coffee to your customers but not sure where to start? Get in touch with us now on 01572 774389 or hello@twochimpscoffee.com to find out about our introductory discounts and innovative ways that we can help. Arrange a time to come and visit the team to start an epic coffee journey with us. Best be quick though – we are looking to be wholesale coffee suppliers to just a few establishments in any area. You can’t be different if everyone is selling the same stuff can you?